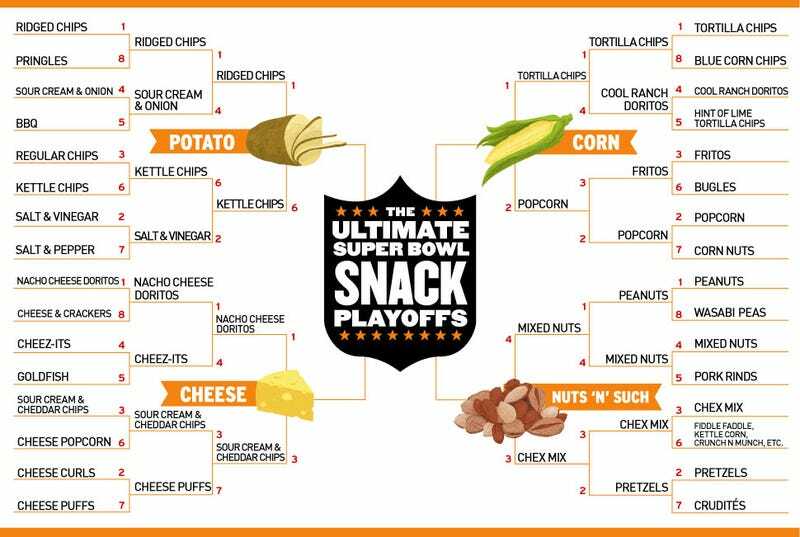 The Ultimate Super Bowl Snack Divisional Finals Are Upon Us. VOTE! Big Peanut took a page out of Big Avocado's playbook, attempting to throw my bracket by ginning up Twitter support. Big Peanut did not succeed. The big story, heading into the Divisional Finals of our Ultimate Super Bowl Snack Playoffs, was the stunning upset by Mixed Nuts in the Nuts'n'Such Division matchup between the victorious #4 seed and #1 seed Peanuts. The contest wasn't even close. Sorry Big Peanut, it was a valiant effort. Elsewhere, the Potato Division has come down to a battle of styles, with Ridged Chips battling Kettle Chips. Over in the Corn Division, Popcorn blew Fritos out of the water with 60 percent of the vote and will face Tortilla Chips in the next round. In the Cheese Division, Nacho Cheese Doritos handily dismissed Cheez-Its by a similar margin as it advances to do battle with Sour Cream & Cheddar Chips. Which brings us to our Divisional Finals, the voting in which can now commence!